Find a limit using a graph. Find a limit using a table. Intuitively, we know what a limit is. A car can go only so fast and no faster. A trash can might hold 33 gallons and no more. It is natural for measured amounts to have limits. What, for instance, is the limit to the height of a woman? The tallest woman on record was Jinlian Zeng from China, who was 8 ft 1 in.1 Is this the limit of the height to which women can grow? Perhaps not, but there is likely a limit that we might describe in inches if we were able to determine what it was. To put it mathematically, the function whose input is a woman and whose output is a measured height in inches has a limit. In this section, we will examine numerical and graphical approaches to identifying limits. the output y-coordinate gets closer and closer to L.
We say that the output “approaches” L.
the output value approaches L.
f(x)= x 2 −6x−7 x−7 . We can factor the function as shown. f(x)= (x−7) (x+1) x−7 Cancel like factors in numerator and denominator. f(x)=x+1,x≠7 Simplify. for the simplified function. We can represent the function graphically as shown in [link]. approaches 7 from either the left or the right, the output approaches 8. The output can get as close to 8 as we like if the input is sufficiently near 7.
is not defined at x=a. lim x→2 ( 3x+5 )=11. This means that a=2,f(x)=3x+5, and L=11. sufficiently near 2 but not at x=2. as described earlier and depicted in [link]. successively closer to 8 by selecting input values closer to 7. In fact, we can obtain output values within any specified interval if we choose appropriate input values. approaches 7 from the right. lim x→ 7 − f(x)=8. lim x→ 7 + f(x)=8. lim x→ a − f(x)=L. lim x→ a + f(x)=L. More commonly, we simply refer to a two-sided limit as a limit. If the left-hand limit does not equal the right-hand limit, or if one of them does not exist, we say the limit does not exist. lim x→ a − f(x)= lim x→ a + f(x). If such a limit exists, we refer to the limit as a two-sided limit. Otherwise we say the limit does not exist. is very near to x=a. 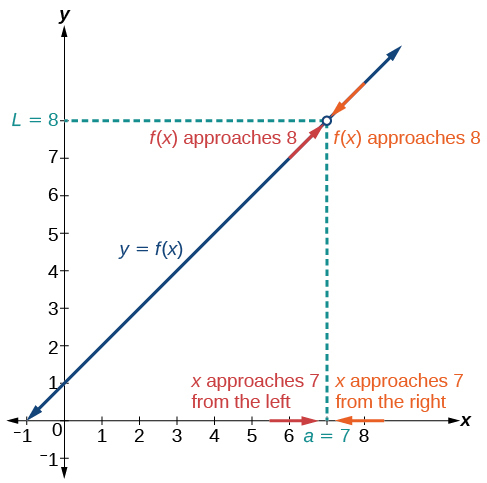 In [link] we observe the behavior of the graph on both sides of a.
so there is a left-hand limit. so there is a right-hand limit. If the left-hand limit and the right-hand limit are the same, as they are in [link], then we know that the function has a two-sided limit. Normally, when we refer to a “limit,” we mean a two-sided limit, unless we call it a one-sided limit. The coordinate pair of the point would be ( a,f( a ) ). Examine the graph to determine whether a left-hand limit exists. Examine the graph to determine whether a right-hand limit exists. is the corresponding function value. the left and right-hand limits are not equal. the left and right-hand limits are equal. shown in [link], estimate the following limits. from both sides. Then we determine if the output values get closer and closer to some real value, the limit L.
To create the table, we evaluate the function at values close to x=5. but nearing 5, the corresponding output also gets close to 75.
from both the left and right. Record them in a table. Evaluate the function at each input value. Record them in the table. Determine if the table values indicate a left-hand limit and a right-hand limit. If the left-hand and right-hand limits exist and are equal, there is a two-sided limit. Numerically estimate the limit of the following expression by setting up a table of values on both sides of the limit. We can estimate the value of a limit, if it exists, by evaluating the function at values near x=0. directly because the result would have a denominator equal to 0, and thus would be undefined. and half of them greater than x=0. Note that we need to be sure we are using radian mode. We evaluate the function at each input value to complete the table. but approaching 0, the corresponding output nears 5 3 .
but approaching 0, the corresponding output also nears 5 3 .
lim x→0 f(x)= 5 3 . Is it possible to check our answer using a graphing utility? Is one method for determining a limit better than the other? No. Both methods have advantages. Graphing allows for quick inspection. Tables can be used when graphical utilities aren’t available, and they can be calculated to a higher precision than could be seen with an unaided eye inspecting a graph. approaches 0, state it. If not, discuss why there is no limit. 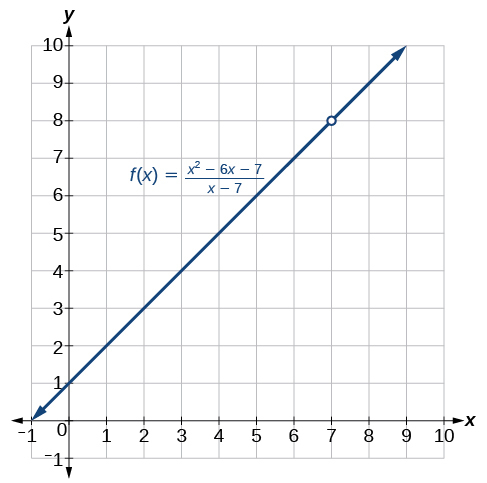 We can use a graphing utility to investigate the behavior of the graph close to x=0. 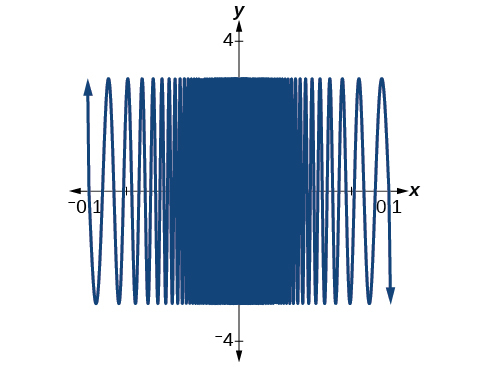 lim x→ 0 − ( 3sin( π x ) ) does not exist. lim x→ 0 + ( 3sin( π x ) ) does not exist. lim x→0 ( 3sin( π x ) ) does not exist. Numerically estimate the following limit: lim x→0 ( sin( 2 x ) ). Access these online resources for additional instruction and practice with finding limits. A two-sided limit exists if the left-hand limit and the right-hand limit of a function are the same. A function is said to have a limit if it has a two-sided limit. 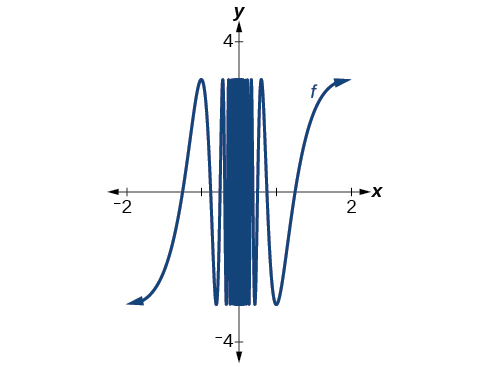 A graph provides a visual method of determining the limit of a function. from the left and the right. See [link]. from both directions so that the resulting output values can be evaluated. 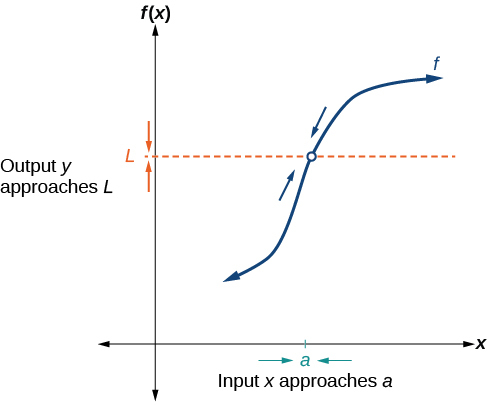 If the output values approach some number, the function has a limit. See [link]. A graphing utility can also be used to find a limit. See [link]. from the left and right, the limit is the value that the function is approaching. the left-hand limit is not equal to the right-hand limit. For the following exercises, draw the graph of a function from the functional values and limits provided. lim x→ 0 − f(x)=2, lim x→ 0 + f(x)=–3, lim x→2 f(x)=2, f(0)=4, f(2)=–1, f(–3) does not exist. lim x→ 3 − f(x)=0, lim x→ 3 + f(x)=5, lim x→5 f(x)=0, f(5)=4, f(3) does not exist. lim x→π f(x)= π 2 , lim x→–π f(x)= π 2 , lim x→ 1 – f(x)=0, f(π)= 2 , f(0) does not exist. g(x)= ( 1+x ) 7 x , and h(x)= ( 1+x ) n x .
state it. If not, discuss why there is no limit. For the following exercises, use numerical evidence to determine whether the limit exists at x=a. If not, describe the behavior of the graph of the function near x=a. Round answers to two decimal places. approaches –0.5 from either left or right. does not exist. Function values approach 5 from the left and approach 0 from the right. If you use this textbook as a bibliographic reference, then you should cite it as follows: OpenStax College, Precalculus. OpenStax CNX. http://cnx.org/contents/fd53eae1-fa23-47c7-bb1b-972349835c3c@8.1. If you redistribute this textbook in a print format, then you must include on every physical page the following attribution: "Download for free at http://cnx.org/contents/fd53eae1-fa23-47c7-bb1b-972349835c3c@8.1." If you redistribute part of this textbook, then you must retain in every digital format page view (including but not limited to EPUB, PDF, and HTML) and on every physical printed page the following attribution: "Download for free at http://cnx.org/contents/fd53eae1-fa23-47c7-bb1b-972349835c3c@8.1."